A new month, a new challenge, a new sponsor! Do check out their supplies... and their service is second to none! You knew it would be a colour challenge, we wonder if anyone guessed correctly! Very seasonal, very traditional... what novel ideas will emerge this week? This is a little stamp from Tim Holtz, Stampers Anonymous, coloured with SU marker pens then stamped and clear embossed to bring out the colours. 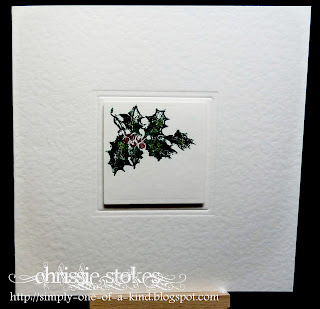 I stamped on the reverse side of the card which was taken from the waste when making the card blank from a sheet of A4. Using the flat side adds a little contrast to the overall textural effect, plus it lends itself to a clearer print. The surround was embossed with the next larger sized Nestie square. 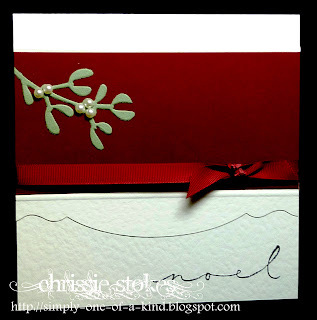 This is a Sizzix mistletoe die-cut, embellished with a few pearls and mounted on a deep red, stripy textured piece of card and with mount cut with a Stampin' Up edging die. The Penny Black sentiment echoes the shape of the die-cut. So for my first card this week I decided to use Memory Box letters die (Typeface) and the Die-Namics numbers to cut out an aperture for the Dec 25. I love these, because unlike Sizzix alphas you can cut letters out of card one at a time. I then back this with a glittery red background by adding pva to some white card and sprinkling with red glitter. I then simply added some twine from the Ribbon Girl and a little holly leaf from a Martha Stewart punch and then finished it with a red pearl. For my second I used a simple technique of embossing the card blank itself. The embossing folder is from a Sizzix set although I am unsure which one -I wish they had the names on them. All new ones I get I use a sharpie to add the name so I know but I have had this one a couple of years. The twine is again from the Ribbon Girl and I think it just finishes it off.... very simple card but very effective! We saw some really glamorous cards last week, maybe we'll have some Christmassy ones this week... or maybe something else!!!! Do join us... and please remember to keep it Clean and Simple! The winner of last month's prize will be announced very soon, do check back! Now I wonder what prompted this colour combo!!!!!??? Perfect prompt for the season and fabulous inspiration. Great challenge & love the inspriational cards & for a change I am reasonably early. Like everyone else it is another card to add to the pile. Loved doing it. Nice challange, beautiful cards of the DT, Great again! Thanks! Thank you for the challenge, and for sharing such beautiful DT Inspiration... it's a joy to play here! 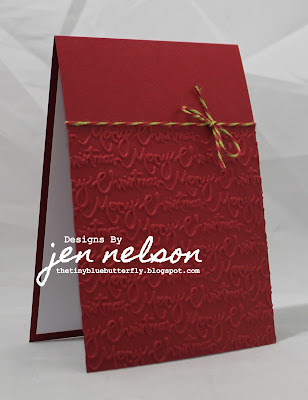 They are all lovely - I love that embossing on the red card, wish I had that folder! Thanks for the challenge! 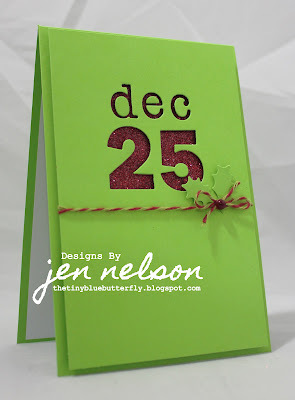 Fabulous Challenge, just the right idea to get me finishing my Christmas cards, FAB examples Ladies. Hi, I am back ( I hope) still very ill but not willing to give in to this), I enjoyed doing this challenge again.